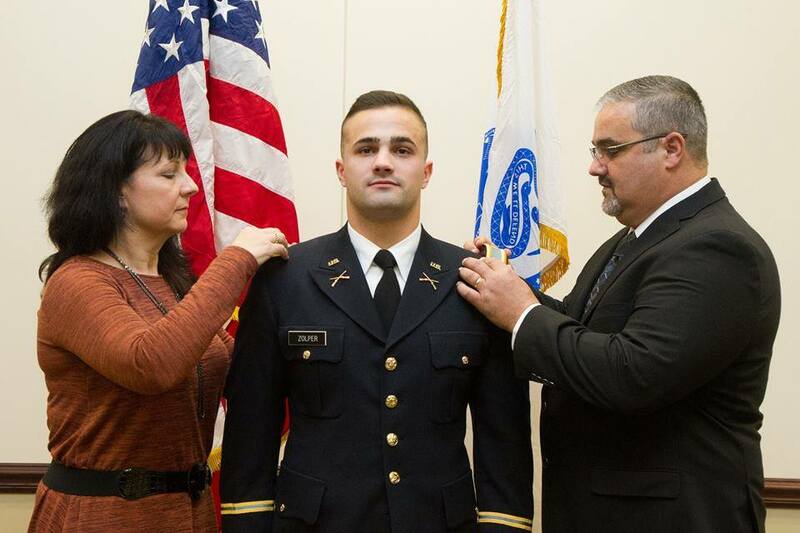 Joseph Zolper (center) with his parents during his Commissioning Ceremony this past December. District 211 has a tradition to honor alumni for the service they have given to their country. Second Lieutenant Joseph Zolper, a 2011 graduate of Schaumburg High School, was honored and thanked for his service by the Board of Education at its March 17 meeting. Zolper is the 13th alumnus to be recognized for his service, and started the meeting by leading the Pledge of Allegiance. In 2011, he was granted an ROTC scholarship at Illinois State University. During his time in the program, Zolper studied History Education and graduated from ISU on Dec. 15, 2015. He commissioned as 2nd Lieutenant on Dec. 11, 2015 and will go active duty as military intelligence with a branch detail in infantry. He leaves for infantry training at Fort Benning, Ga., the week of March 21, 2016. Zolper said he always was interested in joining the military, especially after 9/11, and would speak with recruiters whenever they were at Schaumburg High School. With initial plans to play football at North Central University, he quickly changed his mind while visiting the campus for open house and speaking with a ROTC representative. He filled out the application for the ROTC scholarship that evening with only hours left to make the scholarship’s deadline. Throughout his four years of attending the ISU ROTC program, he has earned many recognitions and accomplishments. In Spring of 2015, he was one of the top 300 Army ROTC cadets from around the country honored to attend the Army Cadet Command George C. Marshall Awards and Leadership Seminar in Fort Leavensworth, Kan. In July 2014 while attending a Leadership, Development, Assessment Course in Fort Knox, Ky., he was ranked as one of the top cadets. As a senior, he was named the ROTC Battalion commander in charge of all the cadets. As a junior, he was the Color Guard Captain, and as a junior and sophomore he was Ranger Buddy Captain. As a sophomore, he was in charge of organizing the Veterans Day ceremony as the master of ceremonies. Zolper was also recognized at this year’s Veterans Day celebration at Fremd High School. Zolper already has experience student teaching at Fremd High School and hopes to continue teaching after being active duty for four years and entering the reserves. As for other students who might light to follow a similar military path, Zolper encouraged students to join the military, but only if they know exactly what type of commitment they are making. The Board of Education will continue Military Recognitions for District 211 graduates who are serving in the military. To recommend a District 211 graduate currently serving in the military for recognition, please complete the online Military Recognition form on the District 211 website.